Thanksgiving dinner wouldn’t be the same without the cranberry — that quintessential fall fruit that combines a bit of sweet with tasty tartness. Cranberry sauce just might be my favorite dish at Thanksgiving, atop a slice of turkey. I love the smell of cinnamon and citrus that comes from cranberry sauce bubbling on the stove. Cranberries are only available October through December, but you can freeze fresh cranberries up to a year. Stock up now. You can also enjoy them dried, canned or in juice form (100% juice). Not only are cranberries delicious but they are packed with nutrients. Cranberries are high in fiber. When it comes to fruit, cranberries have the least amount of sugar. They are loaded with vitamin C, a rich source of antioxidants. These two recipes incorporate products by PURE and are a great addition to your Thanksgiving dinner. Rinse cranberries and place in a slow cooker with Goji, water, cinnamon and allspice. Cook on low until the berries soften and break open. Add orange juice and zest and continue to cook until the sauce is the desired consistency. When the sauce is nearly the consistency you want, add honey to taste. Add a little more water as needed. When ready, remove from heat and serve cool. Refrigerate leftovers. Preheat oven to 400°. Sift and whisk the dry ingredients together. Add the butter to the dry ingredients and cut until crumbly. Whisk the wet ingredients together and add them to the dry ingredients along with the cranberries and white chocolate, until a soft dough forms. Divide the dough in half. Flatten each to about ¾-inch thick. Cut the dough into 8 wedges and place on a greased baking sheet, flattening the sides. Dab the wedges with milk and top with sanding sugar and almond slices. Bake for 12-15 minutes, or until edges are golden brown. Other ways to enjoy raw cranberries are to add them to cereal or stir into scrambled eggs. Try making relishes with them or make a trail mix with dried cranberries. 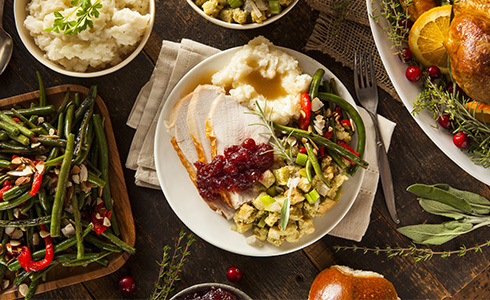 Do you have a favorite holiday recipe to share that uses a product by PURE? Share it with us at https://livepure.com/recipe-submission!